- There is no need for us to carry the baggage of sin in our lives. - We can deal with these things and ask the Lord to forgive and cleanse us. 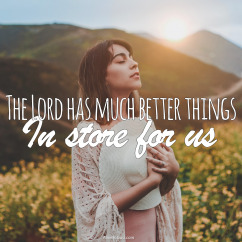 - The Lord has much better things in store for us. 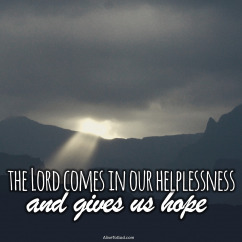 - His life in our lives has the power to bring about change and save our souls. Prayer: Lord, thank You for Your mighty working power that is at work within my life. I choose to give You the ‘right of way’ in my life and I embrace Your words in my heart. Amen. - The Bible gives us certain keys to enjoying a peaceful and a blessed life. - There are things that we need to take note of and that we should apply to our lives. 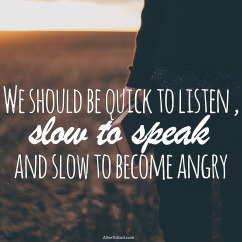 - We should be quick to listen, slow to speak and slow to become angry. - If we will apply this to our lives, things will change and work out for our good. Prayer: Lord, I choose Your way and Your advice over my own thoughts and opinions. Help me not to get distracted and reactionary in my choices, but may I pause long enough to hear Your voice, and respond as You would have me do. Amen. - We should never doubt the Lord’s goodness towards us. - Even if we are going through difficult times, His goodness remains. - There is no darkness in Him at all, so let go of the mistaken tone of distrust. - Reject every unwarranted suspicion regarding His faithfulness and believe. 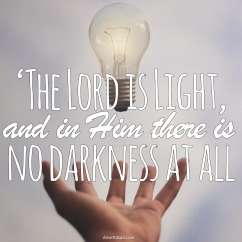 Prayer: Lord, You are my light and my salvation. I will trust and not be afraid. I will believe that You are good and that there is ‘no darkness’ in Your heart towards me. Amen. - Giving good things, is part of the Lord’s character and nature towards us. 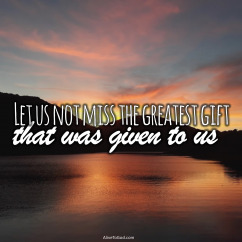 - We serve a good, good Father and He loves and cares for us. - Not even the best earthly father can be compared to our Heavenly Father. - He has so much more in store for us and we need to step out and ask. Prayer: Lord, what a privilege it is to be Your child and to know that You care for me and You want to bless me. I bring my requests to You today, and I place them at Your feet, believing that You will undertake. Amen. - The Lord is your provider. - He will indeed provide you with what is good and needed in your life. - He wants to come and cause your life to be fruitful and productive. - Expect His best and believe for His hand of blessing in all areas of your life. Prayer: Lord, thank You that You are my provider. You are the One who knows my need and knows how to meet that need. I look forward to the blessing and productivity that You have prepared for me. Amen. 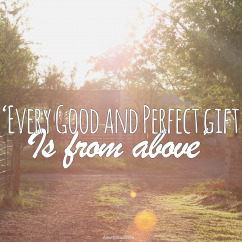 - Do you realise that the Lord has good and perfect gifts in store for you? - Even the good things that you enjoy today, are gifts from His hands. - They are not earned or deserved, they are gifts that are freely given. - Depend on Him to do this, because He does not constantly change His mind. - Every day is a gift and an opportunity to spread the love of the Lord. - When we show love to others, we are reflecting the Lord into their lives. - Be an instrument in His hands to bring blessing and hope to others. 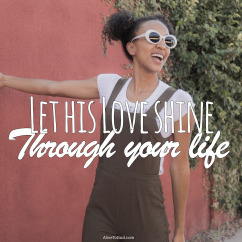 - Let His love shine through your life, and in the way you care for others. - Doing the right thing always leads to blessing in the long term. 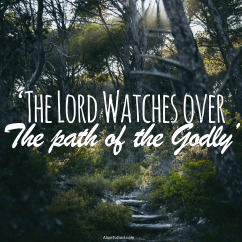 - The wicked may prosper for a moment, but the Lord will watch over the godly. - The Lord does not just watch our steps, but He watches our path. - He knows what He has in store, and He wants to lead us along His path for us. Prayer: Lord, thank You that right now You are watching over me and my life. I choose to do what honours and pleases You, for I know that in the end I will see Your blessing and favour resting on me. Amen. - Our love for the Lord does not go unnoticed by Him. - He sees and He knows those who love and long to serve Him. - To be known by the Lord is to be recognised and accepted by Him. - He knows you by name and He is aware of your requests and He love you. Prayer: Lord, I declare my love for You, my Lord and my Saviour. Thank You that You ‘see’ me, and You are intricately aware of every aspect of my life, hopes and dreams. Amen.